Trying to fit my two-week trip across northern India and Nepal into a single blog post would be like trying to cram every one of Delhi’s sixteen million people into a Japanese elevator. It’s just not going to happen. My winter vacation was everything I could have hoped for – spoiler alert, the Taj Mahal is every bit as breathtaking as it looks – and so much more. I’ll likely be writing about my trip for at least the next month, so I hope you like reading about curry, sacred cows, and tuk-tuk rides. Despite being a staunch supporter of solo travel, I decided that my first venture across the Subcontinent would be with a travel company that specialized in small groups. After some pretty exhaustive research, I settled on G Adventures’ “Delhi to Kathmandu” trip. In retrospect, it was the smartest thing I could have done. If I’d wanted to stick to the Golden Triangle (Delhi, Agra, and Jaipur) in India, I probably would have been fine on my own, but seeing as I wanted to experience as much of this chaotic region as I could in a short amount of time, a guided trip was definitely the way to go for me. As someone who’s used to planning every bit of her travels solo, the ease of this trip was something I’m definitely grateful for. Delhi is madness in city form. Like I mentioned before, sixteen million people occupy this monstrous metropolis, and the general chaos that greeted me when I landed at the airport was a glaring sign that I wasn’t in Japan anymore. I had a day and a half to myself before my tour began, and if I’m honest, during my first afternoon in Delhi alone, the thought that entered my head was, “What on earth have I gotten myself into?” Between the blaring horns, constant barking of dogs, and just general congestion, it was truly unlike any other place I’d been. Tokyo didn’t compare. Neither did London, Paris, Hong Kong, or New York City. I have never felt more like a country mouse in the big city. Fortunately, I’d scheduled a food walk with a local guide on my first evening, so there was no chance of me curling up in my hotel without venturing out into the city. After some Googling, I figured out the best metro route to my destination and headed out to the nearest station. And promptly nearly had a heart attack trying to cross the street. Lesson number one to be learned in India: traffic rules are more like guidelines. This is what Frogger must have felt like. Though I’d done some research before I came, what I hadn’t read was that to ride the metro in Delhi, you have to go through a metal detector and get patted down. I’ve never encountered this before, despite living in two countries in which train/metro travel is incredibly prominent (Germany and Japan), so it was a bit of a surprise, though not an unwelcome one. Thankfully, the metro in Delhi is a relative breeze to use, so I made it to my destination with nary a misstep. And then began the eating. One of the things that I learned on this trip was that Indian cuisine, unlike any other food I’ve had before, is masterful at blending spices and textures together for the best possible interplay. An entirely new spectrum of the word “spicy” has opened up for me. 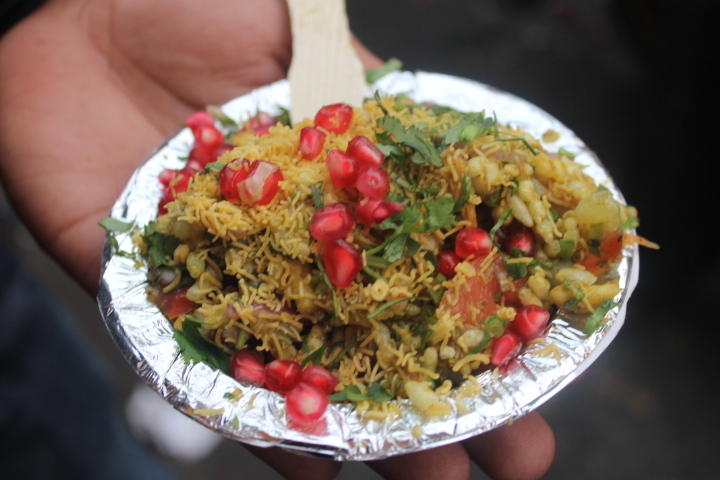 So many people are paranoid when it comes to eating street food when traveling, especially in India, but I don’t have any qualms about it. The way I see it, you can see the ingredients and how they’re prepared, which is a far cry from whatever happens behind the kitchen doors of a restaurant. I’m eager to try basically any morsel that passes my lips, and my guide welcomed that enthusiasm by throwing as much food as he could at me. “Do you ever stop?” he wondered near the end of our walk. Not if I can help it. As it turns out, skipping lunch was the best thing I could’ve done in preparation. This was the best possible way for me to start my time in India. In any country, food is my favorite way to experience a culture firsthand, and it’s often one of the parts that makes the greatest, most lasting impact on me. It was a relief to have someone with me who had grown up in the neighborhood we were in and it was obvious that Vibhor, my guide, had as much enthusiasm for good food as I did. 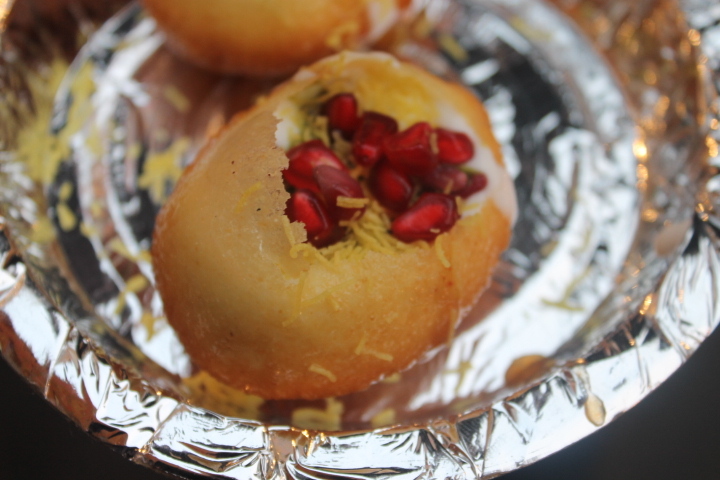 Here’s the full run of the food I ate on my first night in Delhi. Everything was bought from hole-in-the-wall joints that I never would have found on my own, and I don’t think I ever saw another Westerner/foreigner during the entire time. Like a good army, I march on my stomach, and I think I could’ve walked to Jaipur after this meal. 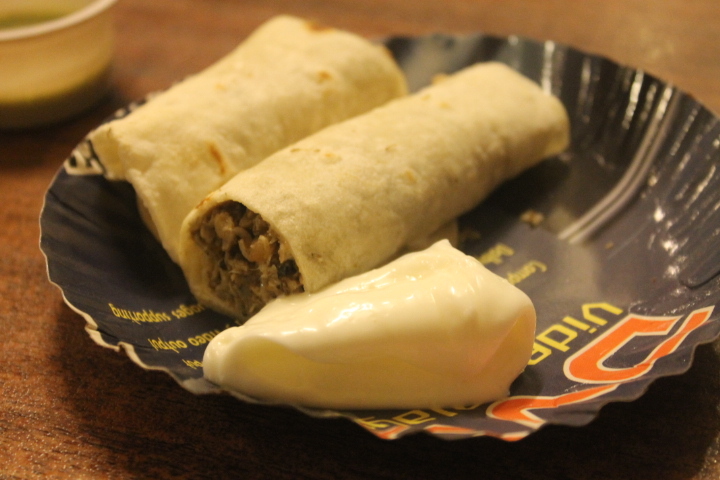 First up: chicken shwarma, served with mayonnaise and (unpictured) a minty sauce whose sweetness was undercut by a hint of coriander. He whipped up fresh batches with speed and precision that was amazing to watch. 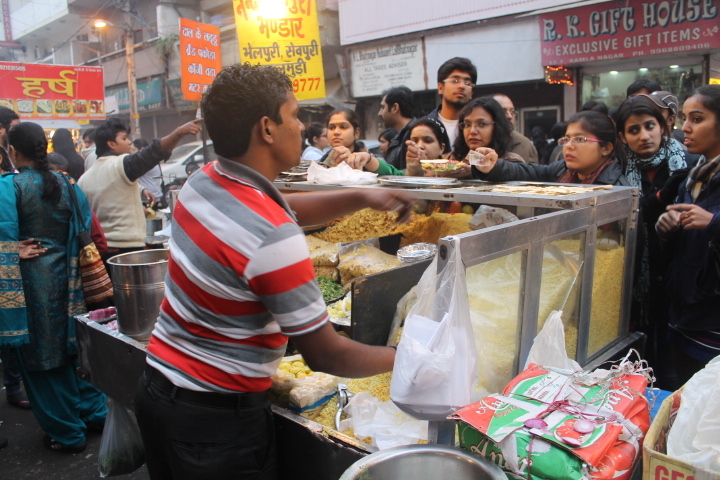 Panipuri (or golgappa) is usually savory and chickpeas, onions, and potatoes make up the main flavor profile, but this was a sweet variation. Yogurt, mint (I think), dried chickpeas are mixed together to fill a hollow semolina puff that’s about the size of an egg. Pomegranate seeds are sprinkled on top. As Vibhor handed this to me, he instructed me, “You have to take this like a shot, okay? All at once.” That made me a bit nervous, but the way these flavors collided in my mouth – the sweetness of the pomegranate, the slightly sour tanginess of the yogurt, the crispness of the semolina – made it clear that you have to taste everything all at once for the full flavor bombshell. I couldn’t help but groan in delight after eating this. Next up, paneer (cheese curd) and vegetable kebabs. A perfect complement to the lighter dishes beforehand. 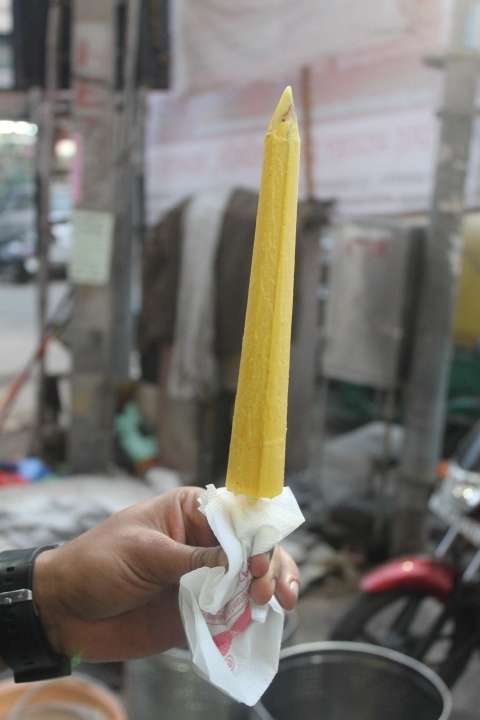 I am an ice cream fiend, and stick kulfi is definitely in the upper echelons of my sweet tooth’s favorite dishes. Sure, you could describe stick kulfi as merely ice cream, but the fact that condensed milk is the main ingredient makes it incredibly rich and creamy. This one was spiced with saffron and cardamom. In most dishes I’ve eaten featuring cardamom, that spice tends to overwhelm, but this was perfectly balanced with the pungent, earthy saffron and tooth-achingly sweet condensed milk. I could’ve happily eaten about six more of these, but I settled for washing it down with water from a fresh coconut bought from a machete-wielding vendor on a street corner. Dessert, round two: jalebi. These may look like the cousins of American funnel cakes, but they’re so much better. 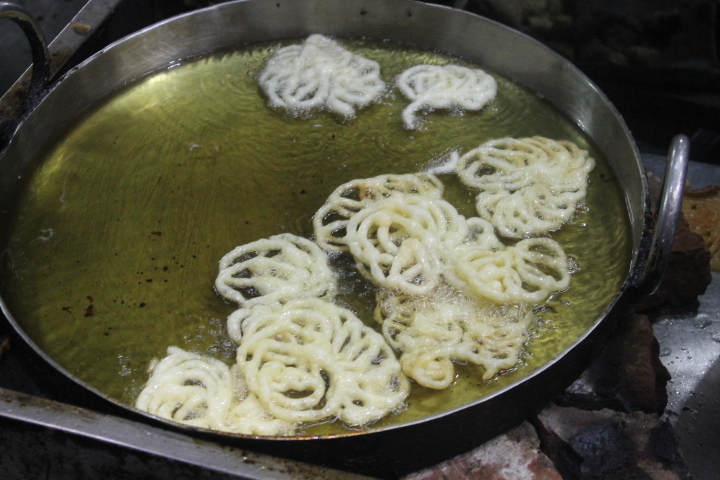 Jalebi are pretty simple: wheat flour batter deep fried and then soaked in sugar syrup. I had them fresh out of the syrup. They were still slightly warm in the center, but the outside was beginning to crystallize, so when I bit into them, the still slightly molten, gooey center melted in my mouth. Pretty sure I moaned. Couldn’t help myself. Last, but certainly not least: samosa, an Indian staple. I had mine fresh out of the fryer, and the flaky crust perfectly played off of the rich potato and chickpea filling. Drizzling sweet and spicy tamarind sauce inside of the puff made it even better. Lovely post! 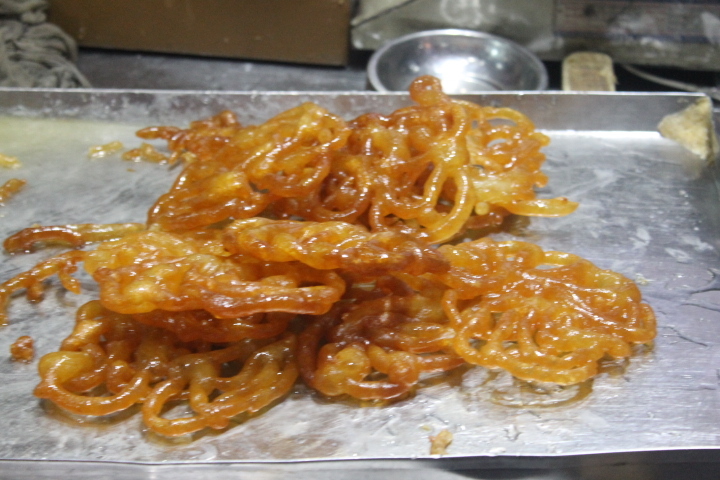 And now I’m re-craving especially jalebi. I discovered those on my recent trip to (south) India, as well. Delhi is indeed chaotic, as is much of Rajasthan, which I visited a few years ago. A fascinating, challenging, stimulating place to visit, for sure. Just looking at my pictures has me craving these foods again! A friend of mine (whose family is originally from Goa) described Rajasthan as “a cultural slap in the face,” and that description definitely rang true for me. But I definitely didn’t consider it a bad thing. I found that chaos exciting more than nerve-wracking! Glad that you enjoyed your travel to Delhi, a city I love with all its chaos and problems. It truly is a foodie’s delight. By the way, the more popular version of golgappas is to have have them filled with a spicy concoction instead of yogurt – Many people love the spicy watery concoction more than the puff. And then there is a wheat flour puff version instead of semolina, which I love with sweet chutney (Tamarind + Jaggery). 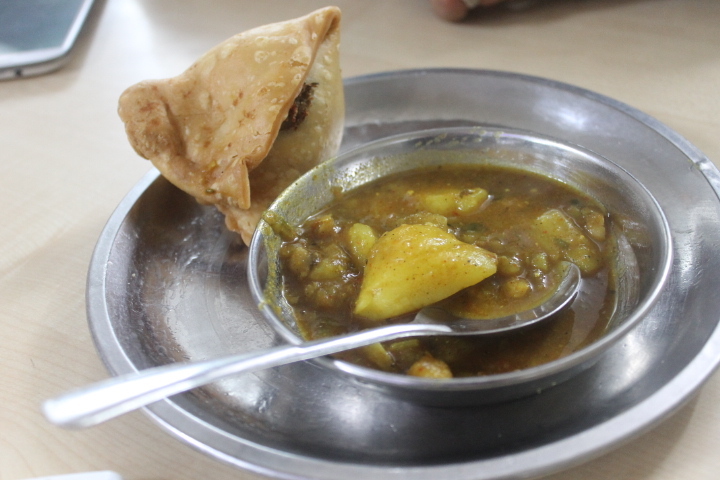 Generally the samosa is filled with spicy Potato and chickpea mix. The tamarind sauce is served separately. There are some other versions of samosas – filled with just the chickpeas or cauliflower or lentils. Thanks for your corrections! 🙂 I’d known that golgappas are usually spicy/savory, but I wasn’t sure if there was a specific name for the sweeter, yogurt-filled variety I had. Is that popular, or might it have been a specialty of the stall we went to? My tamarind sauce was served on the side of my samosa at the start…but after the first bite through the crust, I couldn’t help but drizzle all of the sauce inside! I figured that meant more coverage than just trying to dip the samosa. 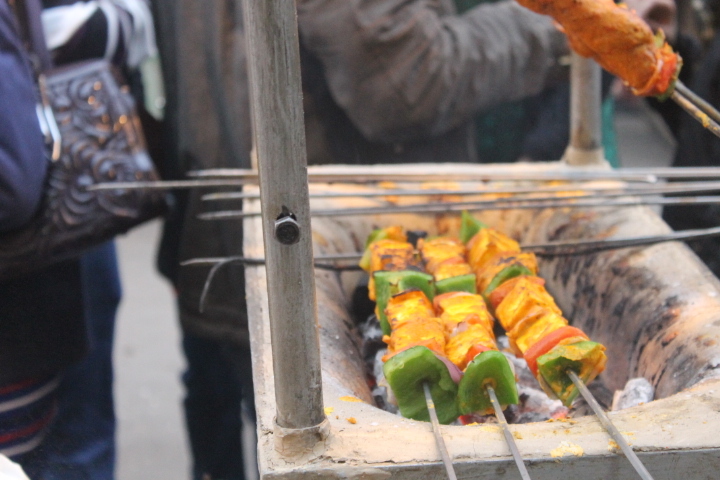 If you visit Delhi again, must go to a place called Dilli Haat in South Delhi – there you’ll have the option to taste food items from various states/regions across India. Even though its regular tourist place (for souvenir shopping), the food joints there are popular among the local foodies too.